The Dead Sea is a lake between the West Bank and Jordan. 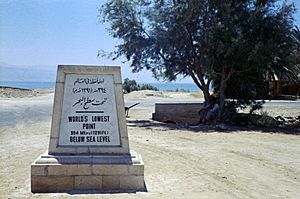 It is 418 metres (1,371 feet) below sea level. It is the lowest point on the surface of the Earth. From 70,000 to 12,000 years ago, the lake level was 100 m (330 ft) to 250 m (820 ft) higher than its current level. 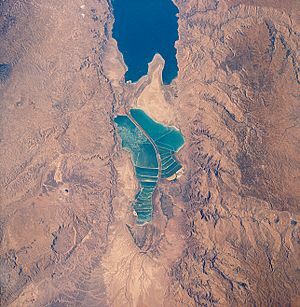 This lake, called "Lake Lisan", fluctuated dramatically, rising to its highest level around 26,000 years ago, indicating a very wet climate in the Near East. Around 10,000 years ago, the lake level dropped dramatically, probably to levels even lower than today. During the last several thousand years, the lake has fluctuated approximately 400 m (1,300 ft), with some significant drops and rises. Current theories as to the cause of this dramatic drop in levels rule out volcanic activity; therefore, it may have been a seismic event. 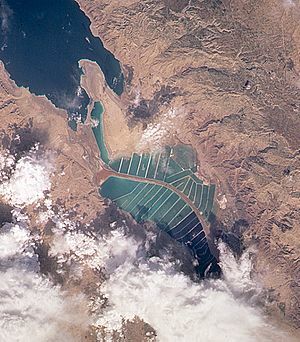 Until the winter of 1978–79, when a major mixing event took place, the Dead Sea was composed of two stratified layers of water that differed in temperature, density, age, and salinity. The topmost 35 metres (115 ft)* or so of the Dead Sea had a salinity that ranged between 300 and 400 parts per thousand and a temperature that swung between 19 °C (66 °F) and 37 °C (99 °F). 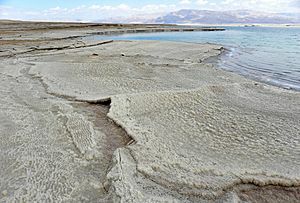 Underneath a zone of transition, the lowest level of the Dead Sea had waters of a consistent 22 °C (72 °F) temperature and complete saturation of sodium chloride (NaCl). Since the water near the bottom is saturated, the salt precipitates out of solution onto the sea floor. 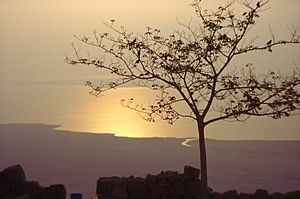 In times of flood, the salt content of the Dead Sea can drop from its usual 35 to 30% or lower. The Dead Sea temporarily comes to life in the wake of rainy winters. In 1980, after one such rainy winter, the normally dark blue Dead Sea turned red. Researchers from Hebrew University of Jerusalem found the Dead Sea to be teeming with a type of algae called Dunaliella. The Dunaliella in turn nourished carotenoid-containing (red-pigmented) halobacteria, whose presence caused the color change. Since 1980, the Dead Sea basin has been dry and the algae and the bacteria have not returned in measurable numbers. In Template:Bibleverse-lb there is a specific prophecy that the sea will ".. be healed and made fresh", becoming a normal lake capable of supporting marine life. 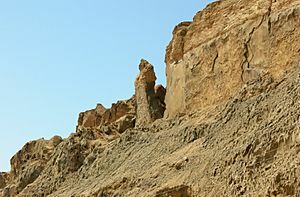 A similar prophecy is stated in Template:Bibleverse-lb, which says that "Living waters will go out from Jerusalem, half of them to the eastern sea (likely the Dead Sea) and half to the western sea (the Mediterranean)..."
Mount Sodom, Israel, showing the so-called "Lot's Wife" pillar made of halite like the rest of the mountain. The first major hotels were built in nearby Arad, and since the 1960s at the Neve Zohar resort complex. On Jordanian side, three international franchises have opened seaside resort hotels near the King Hussein Bin Talal Convention Center along the eastern coast of the Dead Sea. Dead Sea Facts for Kids. Kiddle Encyclopedia.